Email archiving can be implemented by subscribing to a hosted service-commonly called "software as a service" (SaaS)-or by licensing software and installing it in-house (on-premise). 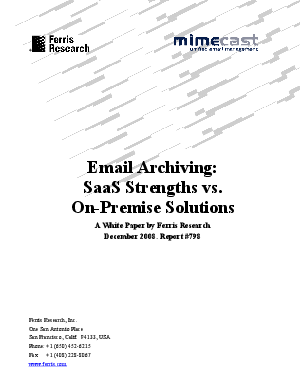 This Ferris Research white paper explains the main strengths of the SaaS approach over that of the on-premise approach. To ensure balance, potential customers should also consider on-premise strengths that may apply in their environment.